Laika’s track record for producing top quality animated films is so strong that it matches early-years Pixar; even at their weakest, the stop-motion animation studio has made movies that really go out of their way to treat audiences like mature, thoughtful individuals who don’t want to see yet another cartoon movie with fart jokes. Their fifth overall film, Missing Link, is yet another one of those movies; it may not be as thematically heavy as some of their previous features, but as a fun and delightfully old-fashioned adventure film with likeable characters and a sweet nature to it, then it serves as a massively entertaining family ride. The movie starts out with Sir Lionel Frost (Hugh Jackman), a heroic but pompous investigator of mythical creatures who receives a letter detailing the sighting of the legendary Sasquatch somewhere in the Pacific Northwest, which he sees as a chance to finally obtain membership to the prestigious Optimates Club, fronted by their stubbornly single-minded leader Lord Piggot-Dunceby (Stephen Fry). Frost heads to America and very quickly stumbles upon the beast himself – only to find that he can not only talk (and has the voice of Zach Galifianakis) but has acquired a fair amount of knowledge to a point to where he was the one who drafted the letter in the first place. As it turns out, the creature – dubbed Mr. Link by Frost – wants his help in finding the mythical Shangri-La where his Yeti cousins live, so that he may live with them and not be so lonely anymore. This prompts the two adventurers to embark on a perilous globe-trotting adventure together, joined along the way by Frost’s former lover Adelina Fortnight (Zoe Saldana) but also stalked by perilous hitman Willard Stenk (Timothy Olyphant), who’s been hired by Piggot-Dunceby to ensure they don’t reach their destination. If you’re going in to this film expecting a story as deep or complex as something like Kubo and the Two Strings or ParaNorman – the latter of which was directed by Missing Link’s director Chris Butler – then you’re likely to come out of it a little disappointed. Its primary focus here is to be a fun, family-friendly adventure that prides itself on strong characters and some absolutely beautiful animation, and luckily it does those things extremely well, enough to help you overcome what it may lack in the storytelling department. That’s not to say that the story they have going on here is bad, it’s just that it’s a lot simpler than you may be expecting with Laika; it’s much more of a straightforward buddy road trip movie with a hint of Indiana Jones and Jules Verne thrown in for good measure, but it manages to mould out of it something that’s fun, filled with good messages, a lot of engaging action and suspense, and a cast of identifiable, well-meaning characters that are extremely easy to root for. Even though Jackman’s character is pompous and rather arrogant, his humanity does show in scenes that make him easy to like, despite his many flaws; meanwhile, the Missing Link of the title is impossible to hate, with Galifianakis’ delivery being both whip-smart and entirely heartfelt in its delivery, and making for a strong and loveable counterpoint to Jackman’s straight-man figure. I also admired that the character also appeared to have been written as though he is on the autistic spectrum; he seems to share many of the traits, including not understanding figurative speech, being somewhat clumsy but always well-meaning, and having a bright spark of intelligence that comes with a somewhat awkward exterior. I can easily see young children with the condition really identifying with Mr. Link, and I do hope it was the filmmakers’ intention to make him seem like he’s on the spectrum, because that is partly what I love about Laika; they aren’t afraid to bring up sensitive and hard-hitting issues while also making themselves still accessible to audiences everywhere. The other thing I love about Laika is their increasingly fantastic array of animation, which is put to absolutely stunning use here. I have no idea how they make something as historically jerky as stop-motion and make it look so seamless, but whatever they do it never ceases to amaze me; I felt that way about all of their previous movies, including their last feature Kubo and the Two Strings (which ended up not only being Oscar-nominated for Best Animated Film but also for Best Visual Effects, a rare achievement for a film made up entirely of non-real entities), and I feel it again with this one, especially with how beautiful and colourful every last bit of scenery and backdrop looks here, even in scenes where the moonlight shines brightly down onto the scene. These are such impressive visuals that they would stand out even in a live-action feature, and it soothes the spirit to know that the vast majority of it was entirely crafted by hand (though one suspects a touch of computer effects were added to spice it up a little, but even if there was it’s still incredibly woven together). If nothing else, you can’t deny that this film is just as wondrous to look at as the mythical creatures our heroes come across throughout it. Some will undoubtedly take the fact that it’s a lighter story and use that against it, but this is not a situation like Cars where it feels like a complete downgrade after a slew of great movies; even though it may not tackle as many heavy themes and topics as some of Laika’s other work, this is a wondrous, charming and endlessly loveable family adventure that’s fun, funny, emotional, and full of such genuine heart that should make you want to seek it out for yourself. 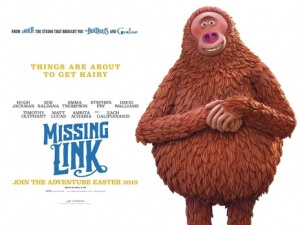 Missing Link more than makes up for its lighter story, at least in comparison to Laika’s previous work, with a fun, charming and loveable adventure with strong and likeable characters as well as some absolutely stunning stop-motion animation that makes it one of their more visually pleasing outings.